Wicklow is a natural scenic wonderland, a landscape rich in breathtaking scenery. There are long sandy beaches, which stretch enticingly along the length of the east coast. Wicklow is also a land of majestic mountains and spectacular valleys like Glenmalure, Glencree, Glenmacnass and the magnificent Glen of Imaal. But famous worldwide is the beautiful Glendalough, the valley of the two lakes, a monastic settlement in the 6th century and still exuding a sense of peace and tranquility. 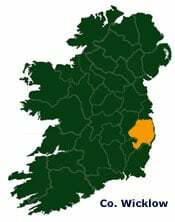 County Wicklow is a land of domed granite mountains and purple glens, of soft rolling hills and silvery streams rushing cool and clear from mountain and bogland to swell the rivers of the countryside, or dash headlong towards the sea. The stately cone of the Great Sugarloaf Mountain dominates the north of the county. There the oft-traversed Military Road attains a height of 1,634 ft., at the Sally Gap, where Dublin’s Anna Livia, the River Liffey is born. Wicklow is an area also rich in history and culture, no less than five of Ireland’s Heritage Gardens are located here. Archaeological and historical remains abound, particularly in West Wicklow but there is far more to Wicklow than her magnificent scenery. There are 20 golf courses to choose from, while crystal streams lie in the folds of the Wicklow foothills waiting to challenge the expert angler or first time fisherman. Mountaineers and ramblers could seek no better terrain, yachtsmen and windsurfers could ask for no better coastline.